NutraStim Hair, the powerful and affordable FDA-Cleared comb to stimulate hair growth and restore the hair’s natural radiance, announced its anticipated launch on leading entertainment and lifestyle retailer HSN on May 3rd, 2016. The Laser Hair Comb will be the first-ever hair growth device to be featured on HSN, bringing their consumers an FDA-cleared at-home hair loss solution that offers the quality and convenience of professional low-level laser light therapy. Beginning May 3rd, NutraStim will be televised on HSN as well as available for sale across HSN’s digital platforms, including mobile and online via HSN’s website. Best of all, every NutraStim Laser Hair Comb purchased via HSN is covered by a six-month extended return policy to ensure customer satisfaction. “We are thrilled to share the NutraStim Laser Hair Comb with our customers,” said Alicia Valencia, Senior Vice President of Beauty at HSN. “As a beauty company focused on developing advanced treatment for hair loss and overall hair health, we are pleased to join with HSN to celebrate the on-air launch of NutraStim and broaden its availability for consumers,” said Chaz Hatfield, President of NutraStim. The NutraStim Laser Hair Comb has been FDA cleared for the treatment of androgenetic hair loss (aka hereditary / pattern hair loss) and is a safe and effective way to reclaim your hairline – in the privacy of your own home. NutraStim uses 12 low-level lasers to stimulate hair follicles to promote hair growth. 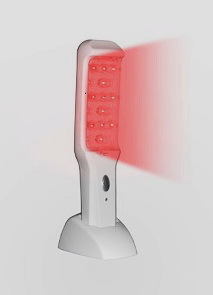 The NutraStim Laser hair comb is a cordless rechargeable device allowing the user to move about more freely with no need to buy or replace batteries. Three gentle eight-minute sessions per week are all it takes to promote hair growth and start your journey to thicker, fuller hair. For more information on NutraStim, watch HSN live starting May 3rd or visit HSN.com and NutraStimHair.com. NutraStim Laser Hair Comb is an FDA Cleared, handheld, cordless and easy to use device intended to promote hair growth. Designed and assembled in the U.S.
NutraStim is designed to treat androgenetic alopecia and promote hair growth in females who have Ludwig-Savin Scale 1-4, 11-2 or frontal patterns of hair loss; in males who have Norwood Hamilton Classifications IIa to V and in both who have Fitzpatrick Skin Types I to IV. Available for $279.00, results may vary. For more information, visit http://www.nutrastimhair.com. HSN is a leading direct-to-consumer live content retailer, offering a curated assortment of exclusive products and top brand names to its customers. HSN incorporates entertainment, inspiration, personalities and industry experts to provide an entirely unique shopping experience. At HSN, customers find exceptional selections in Health & Beauty, Jewelry, Home/Lifestyle, Fashion/Accessories, and Electronics. HSN broadcasts live to 95 million households in the US in HD 24/7 and its website – HSN.com features more than 50,000 product videos. Mobile applications include HSN apps for iPad, iPhone and Android. HSN, founded 38 years ago as the first shopping network, is an operating segment of HSN, Inc.